30-day guitar challenge: Combining taps and bends is a great way to create smooth lines, which can sound quite atypical for the guitar and are more akin to a pitch bend of a synth. To make your licks sound as great as possible, they need to sound in tune so bending accuracy is the most important element to get right here, so be aware of the size of the bend you are going for. In the following examples, there are a mixture of tone bends and semitone bends. This requires a combination of well controlled bending technique and and good ears. Players like Steve Vai, Eddie Van Halen and Steve Lukather are well known for adding tapped notes to bends. It’s a great way to add extra melody notes to your licks. Try holding a bend, then tapping on to any fret above the one you’re bending. The important thing to remember is that the pitch of the resulting tapped note depends on the amount the string has previously been bent. If you are bending a tone with your fretting hand, then the tapped note will sound two frets higher than usual. If you have bent a semitone, then the tapped note will sound a fret higher than it usually would. A distorted tone is required to allow the notes to sing and sustain, but don’t be tempted to overdo the gain as this can sound messy. In any case you will need to use muting to silence the unused strings. 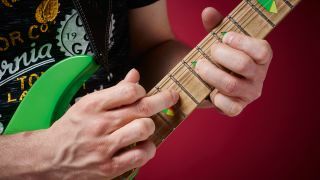 Typically, you can rest the side of your picking-hand palm on the lower strings to keep them muted; lightly touching the treble strings with the underside of your fretting fingers should keep them under control too. To open up all of your tapped note options, you will benefit greatly from learning your scales along the string, rather than in the typical scale positions. Example 3 uses various notes from the A Major scale, all played on the second string whereas Ex 4 is an example of D Mixolydian (D-E-F#-G-A-B-C) played along the length of the third string. There are a couple of ways you can go about this. The first one is to learn the notes of the scale - for example, A major (A-B-C#-D-E-F#-G#) - and find those notes on the string. This is a great way of improving your fretboard and scale knowledge. Another option is to look at the scale in terms of tones and semitones. For example, the major scale is a sequence of: tone-tone-semitone-tone-tone-tone-semitone. This option makes sense when adding taps to pre-bent strings as keeping track of the offset note names can become a little confusing. Play through each example slowly and focus on making the notes all sound nice and even; the tapped notes and fretted notes should all be the same volume. Timing is also important and can become uneven when combining both hands. Once you are comfortable, you can gradually speed up with the help of a metronome. Hammer on from 7th to 9th frets with the first and third fingers, then use your picking hand finger (eg. second finger) to tap the 11th fret. Use both hands to bend the string up and down a semitone before pulling off to the 7th fret. Now repeat the whole process again, but this time tap the 12th fret and bend up and down a whole tone. This lick is in E Minor Pentatonic (E-G-A-B-D). Use your fretting hand to bend the 15th fret, first string, up and down a tone, then pull off to 12th fret. Next tap the 17th fret on the second string and bend the 15th fret up and down a tone. Alternate the pattern between the two strings starting with the tapped note each time. Use your fretting hand to bend up a tone at the 12th fret. While holding the bend use your tapping finger to add the 13th fret. Because of the previously bent string, this will sound like 15th fret. Keep bending the 12th fret and tap the 15th, 17th and 20th frets, which will sound like 17th, 19th and 22nd frets respectively. Start this D Mixolydian (D-E-F#-G-A-B-C) lick by tapping at the 19th fret ‘D’ root note. Next bend the 9th fret up and down a tone with the third finger of your fretting hand, then pull off to the 7th fret. Next tap the 19th fret again and move your fretting fingers up to 11th fret. This time bend up and down a semitone before pulling off. Continue moving up and down the string, making sure your bending is in tune and within the scale.